House Tours, Design Ideas, Ed Begley, Jr. It's a large everything-home-design party. Dwell on Design is at the Los Angeles Convention Center from June 25-27, 2010. For some people, it's all about dining room chairs. Others like outdoor living. Us? We're surely not alone when we say, on a house tour, the kitchen and bath are extremely interesting places. 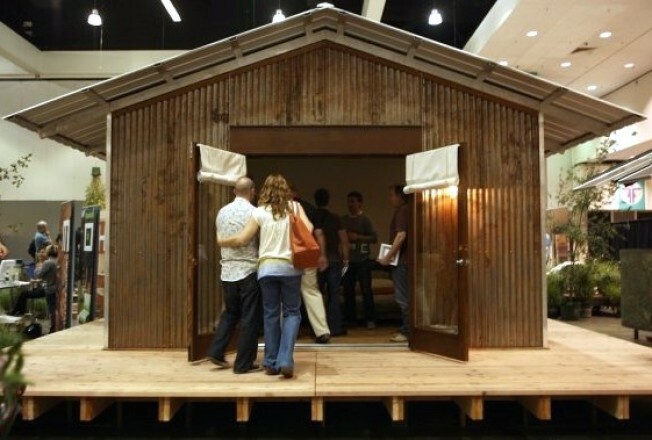 But until the "Kitchen and Bath Show for Lookity Loos" comes along, we will be highly satisfied with the Dwell on Design expo, which is at the Los Angeles Convention Center from Friday, June 25 through Sunday, June 27. There are many exhibitors on the big floor. Room and Board will be there. People who know about low-flow toilets and fancy sinks will be showing as well. And mid-century enthusiasts aplenty. There are also a handful of home tours, a talk on sustainability with Ed Begley, Jr., and other domicile experts who can advise on look and function. We swear we won't talk tubs the whole time, but it is hard. Nearby at the convention center, on Saturday, June 26 and Sunday, June 27, is Alive and Well LA; look for NBCLA.